At the beginning and end of the day, baseball is about having fun, and for the 5,772 fans who braved frigid temperatures in Cleveland Tuesday evening, a three-minute Replay Review wasn't quite what the doctor ordered. 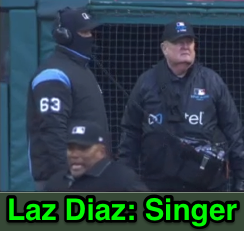 Enter home plate umpire Laz Diaz, MLB's resident officiating comic. With both teams and other umpires dressed in their cold weather best, including 2B Umpire Manny Gonzalez wearing Laz's #63-adorned heavy base jacket, Diaz turned lemons into frozen lemonade, singing and bobbing along to the Progressive Field DJ's Replay Review music selections. In the end, replay overturned Gonzalez's out call on Niko Goodrum's daring tag up on a fly ball to center. *Paid attendance for Tigers-Indians on April 10 was 10,078, but only 5,772 fans reportedly showed up.